2-Row. 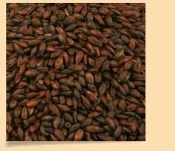 The chocolate flavor is very complementary when used in higher percentages in Porter, Stout, Brown Ale, Dunkels and other dark beers. Use in all styles for color. Contributes brown hues.